Most bathrooms that you come across are shiny, sparkly, clean and actually come off as sterile at times! This is because most people opt for clean, whites and creams for their bathroom’s colors, unaware that some gorgeous rustic colors can actually be super calming and by bringing in different colors and texture into your bathroom, you’ll actually create a space that won’t feel as much like a sterile clinic, but will have some character! A rustic bathroom can be created using some many different types of ideas and finishes, and even different bathtubs and washbasins are all that you need to recreate your bathroom into a blissfully rustic, charming and earthy space. We’ve collected a few ideas that you can use to help bring the rustic and natural look to your bathroom space, by using simple elements like wood, brick, and concrete you can transform your bathroom into any kind of rustic styled bathroom. If you have a fairly small bathroom, and you feel like you need more space, opting for a rustic styled bathroom can do so much to your space! This bathroom is really small, but with a classic freestanding bathtub with epic and antique looking claw foot finishes, this bathroom has been opened wide up by breaking out a huge part of the wall and installing a window in its place. Of course, having such a massive window in a country house might work, but may not work in the city or suburbia, but you could always get a realistic 3D wall mural sticker fixed onto the wall, allowing you to create whatever scenery you want. Notice how there are soft touches of wood, this brings out the rustic feel in the room. 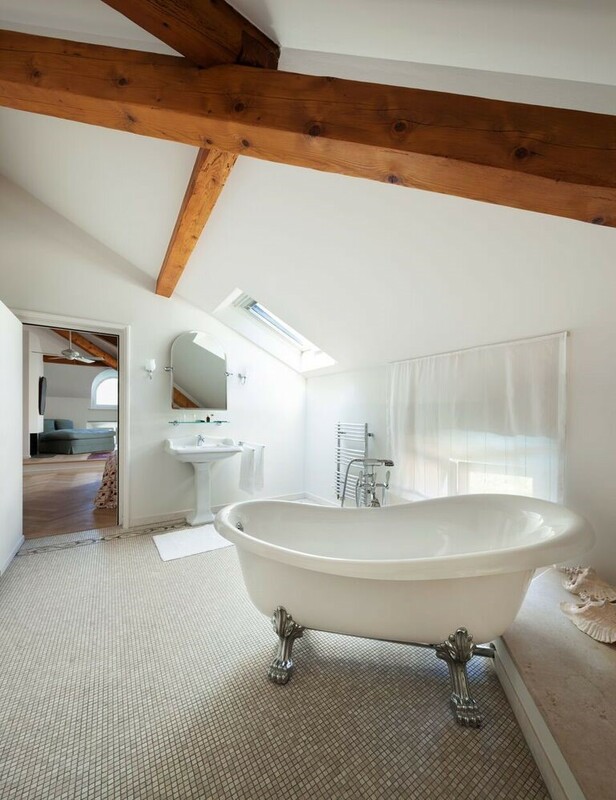 Many houses that have their master bathrooms in the attic have also got loads of space! This means that you can easily install a new little room in there and transform it into a bathroom. By keeping the wooden beams, you’ll naturally create a rustic feel, and again a claw foot bathtub always adds in a rustic and carefree feel. We love the tiny, miss matched tiles used for the flooring, but we would definitely take some of the white out of this bathroom and maybe even cover the wall by the entrance door with some rustic looking face brick wallpaper. By installing a rough and unvarnished or stained looking wooden floor into your bathroom, you’ll instantly create a rustic vibe. 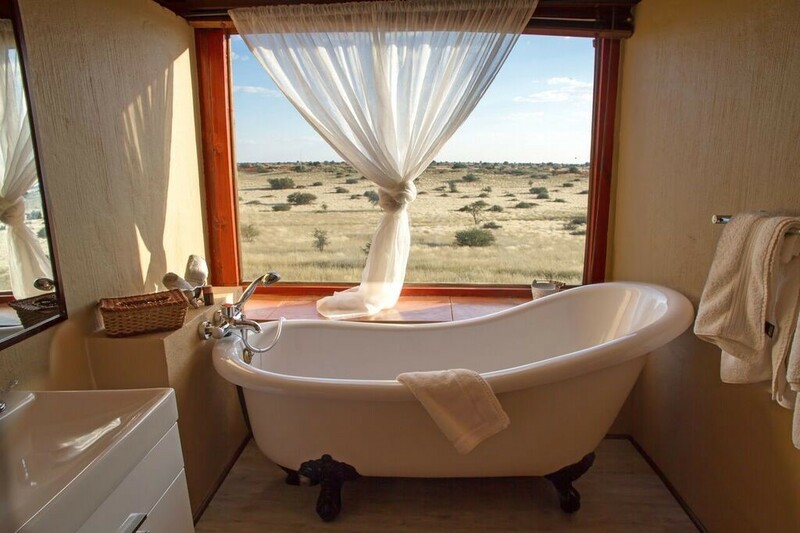 We love how this bathroom has been created to look simplistic but also rustic, with a built-in bathtub being displayed as a freestanding bathtub, you create a ‘naked feel in the space. The wooden ceiling, as well as the beams that have been painted in that same off-white/gray as the floor creates an even more in-depth feel of naked rustic vibes. Bricks are the perfect rustic element for any bathroom! Especially if you want to keep is simple but still very roughly rustic. 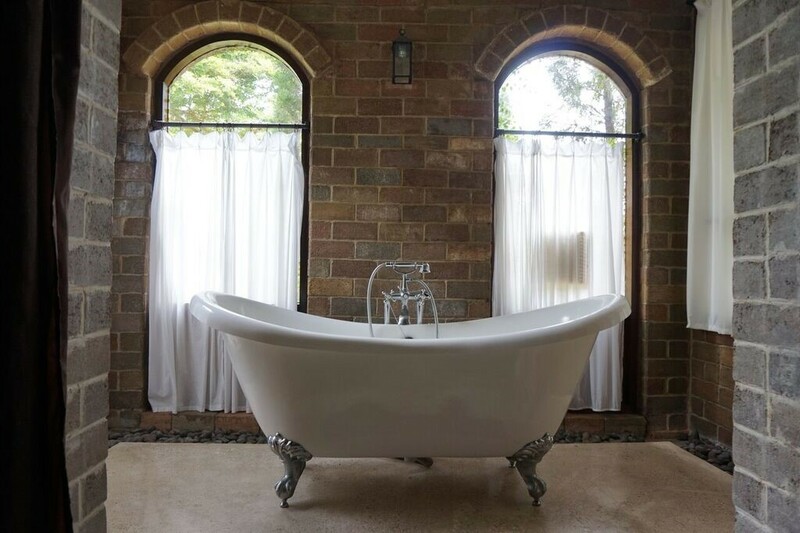 We love how the claw foot freestanding bathtub has been used as a focal point for the bathroom, with a simple floor, finished with pebble stones around the edges of the room. The large windows allow so much natural light in, yet not pulling away from the rustic feel of this bathroom. We would add an antique looking chandelier to this bathroom for an elevated and elegant rustic look. This is a much more elegantly styled rustic bathroom, but still very rustic. If you have a big space to work with, you can do so much with a rustic bathroom. 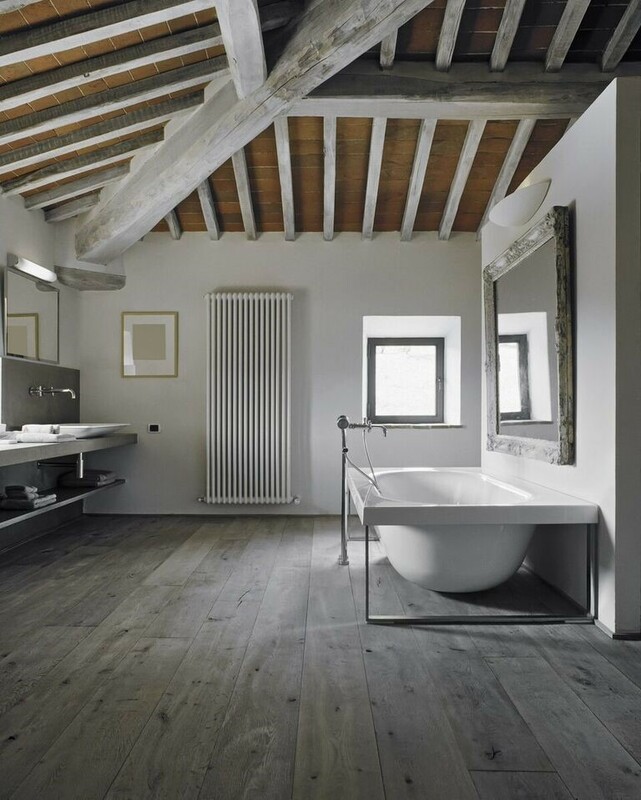 We love how wood focused this bathroom is, dark wood floors, wooden ceiling beams and AGAIN - the claw foot freestanding bathtub, which essentially bring the entire look together. The white and huge inflow of natural light kills the overbearing wooden features making it a lot softer. Essentially, a rustic bathroom can be created to whichever element you please, just make sure that you include your creative and artistic personality into the entire process, and you’ll end up with a space that you really love. Daring Enough to Take on Dreamy Door-less Showers?